Razor S vs A? What’s the Difference? So a brand new Razor scooter model appeared suddenly at retail stores in the past month. 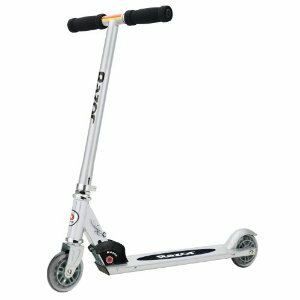 It’s called a “Razor S Scooter” and is sold at Target, Walmart, Toys R Us, and other retail outlets. Right now there is a Black Friday sale going on where the “Razor S” is on sale at many brick and mortar locations. So what is the difference between the Razor A and the Razor S scooter? By all features and accounts, it is the same model as the original Razor scooter that was released back in 1999. What are the differences between the Razor Special Edition and the Razor A line? It’s made out of steel rather than aluminum. The riding capacity has not changed from 143 lbs, nor is steel going to do you any good vs high grade aluminum other than to raise the weight of the scooter. The handlebars aren’t adjustable! They’re at a fixed height. Have a kid that’s a little taller or shorter than average and you’re out of luck. They are removable for storage, but the height cannot change unless you want to take a hacksaw to the post. Why would Razor do this? Nostalgia maybe? Picture this. Somewhere there is a warehouse filled with thousands of decade old metal parts for the original Razor scooters that they kept in case of warranty issues or repairs that never got used. Did some enterprising Razor employee say “I know! We’ll call it the Special Edition Razor Scooter and only sell them during the holiday season?” Maybe. Who can say for sure. Should you buy a Razor Special Edition Scooter over the newer Razor A model line? That’s up to you of course. For most people, the lack of adjustable handle bars is going to be a real drawback, as you can see if you click HERE are read the reviews. Is the price any better? Not really. You see, you can get the Razor A scooter online here at an everyday price of $26. That’s including shipping and no sales tax for over 95% of the country. So the “Black Friday” Razor S scooter deal where you fight the lines and with sales tax end up paying more than if you just ordered it straight to your door at the everyday online price. When the Black Friday Razor scooter deal is gone, lots of people will pay $34.99 or $29.99 for this scooter at Target or Walmart (plus sales tax) because it says “Special Edition” on it, then be stunned on Christmas morning when they can’t adjust the handlebars. Not such a good deal huh? Stay home, play with your kids, get the Razor A scooter delivered for a lower price.